PanARMENIAN.Net - "Game of Thrones" is rushing to the finale on HBO even though George RR Martin hasn't even released Book Six Winds of Winter yet. Even though the TV show has far outstripped the source novels, it is generally accepted that the principal plot points laid down by Martin will still decide how it all ends on screen. One thing the author, and now the show writers, have always loved is foreshadowing. Only looking back is it possible to see all the clues that were cleverly laid down right from the very beginning. As Season Eight looms ever closer and Book Six looks certain to arrive this year, all the plots are drawing back in together. Guess who were always intended for each other? Everyone has been so focussed on the power struggle between Cersei, Jon Snow and Daenerys. Yet, the entire saga kicked off with another dynastic match being planned. The marriage of Sansa and Joffrey was the deepest wish of Robert Baratheon, although Ned Stark soon changed his mind when he saw what the little prince was really like. But what if somehow Ned's wishes finally come true? So much of what happened next hinged on this. 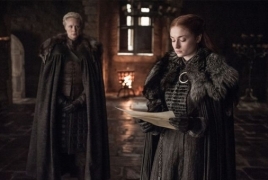 Sansa's blind obsession with being the next queen with golden-haired babies lead her to unknowingly betray her father to Cersei. This lead to Ned's death and the uprising in the North. But what if she could still be Queen and fulfil Robert and Ned's original dream? Redditor zmphotojournal is way ahead, pointing out that Gendry is back – the last known true son of Robert: ""Sansa and Gendry end up together. The person who is most like Ned is Jon Snow. Who knows enough about Gendry to know that he is of noble birth being “The last Baratheon” and is brave and strong and wise in his own way…", Express says. This theory also neatly fulfils another outstanding prophecy: "Cersei is replaced by a beautiful queen of the Maggie and the Frog prophecy…"
Fans are almost unanimous in agreement in their comments with one summing it up perfectly: "Gendry is legitimized and when he and Sansa marry, house Baratheon and house Stark are finally united, Sansa gets a kind, loving and attractive (let's face it she is still shallow) husband, Arya gets Gendry as the brother she wanted, and Gendry gets a woman with some sense and hard-won intelligence to make up for what he lacks." It is the perfect ending. The Lannisters have never had a legitimate claim to the throne, only a Stark can bring the North back into the united kingdom, the majority of fans think Danny will almost certainly die and Jon, if he survives, has never been the sort who wants to rule.